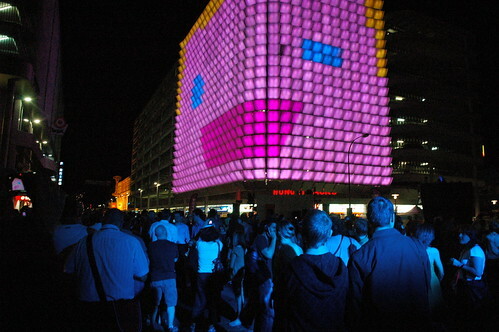 Rundle Lantern is huge, nine storey high, electronic digital display wrapped around the face of a car park at the junction of Rundle Street with Pulteney Street, Adelaide, Australia. 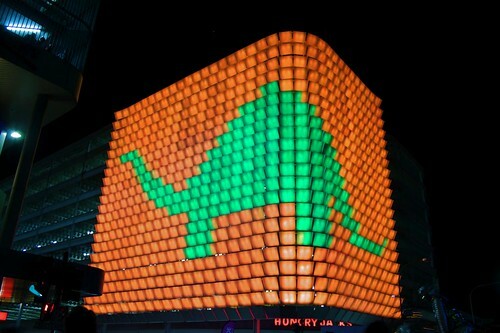 Designed by local firm Fusion at the initiative of the City Council, the display consists of 748 panels of 1.1 m x 1 m which are illuminated by computer controlled LED's. Launched on October 24, 2008 the display lights up from from dusk to midnight. The illumination is through 17,952 LEDs. The red, green and blue LEDs can display upto 16 million colours, which are reflected up onto the panels to create a colourful dynamic imagery. Fusion has also developed Rundle Lantern Simulator to enable users to upload and preview how their video content would look if delivered via the Rundle Lantern.